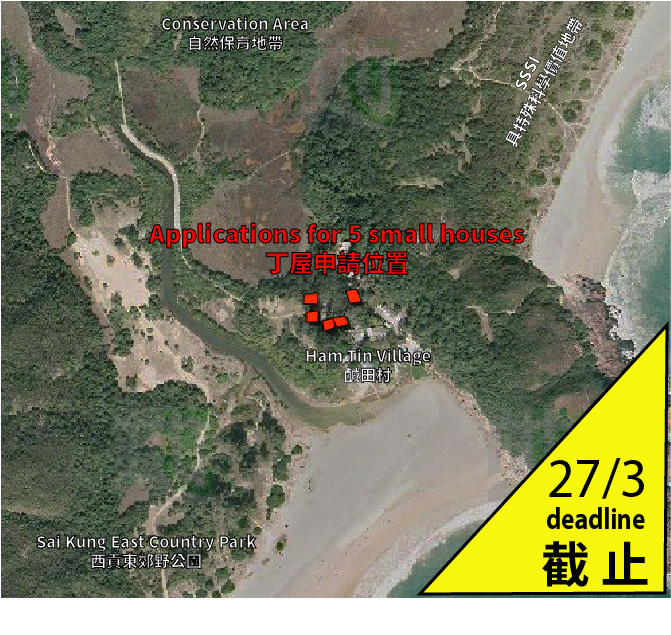 The Town Planning Board has received five applications for the construction of New Territories Exempted Houses behind the beach at the Tai Long Wan enclave in the Sai Kung Country Park. Newspapers reported that the applicants include government officials who work at the AFCD, the department responsible for managing country parks. They claim their right under the Small House Policy which allows random house building with little oversight over quality and environmental impacts. The well-preserved village settlements in Tai Long Wan are of high heritage value. The integrity of the village is still intact and undisturbed. The village clusters in Tai Long and Ham Tin have a high group value for preservation. There are no sewers and sewage will soak away and pollute the ground and nearby waters. Houses here would result in demands for roads and other infrastructure further damaging the area. The landscape and ecological value of Tai Long Wan is cherished by the many visitors who come to enjoy the Sai Kung Country Parks. Let your voice be heard. The deadline for comments on the applications is 27 March 2015. Click here to object.